Chilly weather or no space for a garden doesn't have to stop you from growing your own food. A trip to the garden store for some bulbs — which you can even get in cold weather months — some soil, and a five litre plastic bottle are all you need for a near-infinite supply of fresh onions. Of course, with this setup you can harvest the green parts as much as you like and they will grow back — just don't pluck the whole thing out, because obviously that will be the end of that. Even better, if it's cold where you are or you live somewhere without outdoor space, all this takes is a spot on your windowsill and regular watering to work. 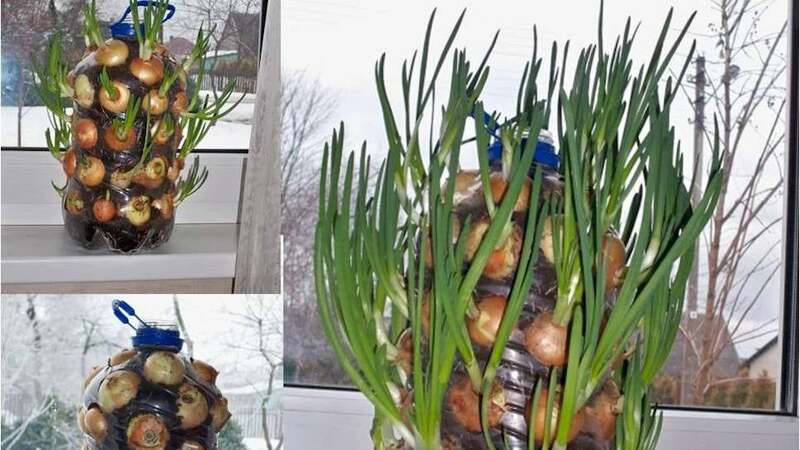 Cut off the neck of the bottle, punch some holes in the sides of the bottle with some scissors, then position the bulbs with the sprouts by the holes, so they will grow out nearly. Layer on the soil and sprouts until the bottle is full, water it, and give it some light. That's all there is to it. As long as it's warm enough and you keep it watered, you'll have sprouts all year long. You can see more photos of the process — and more suggestions to keep your onion mini-garden happy — at the link below.